Getting Yorkshire's flood wardens in the same room is not an easy task, but very beneficial, and important to support local communities. It’s Saturday morning and all is relatively quiet in the city as I make my way to the office, there’s rain in the air but a spring in my step because today is our annual flood warden seminar. Now you may think that making your way to work on a Saturday would be enough to ruin most people’s weekend, but not today. With flood wardens and professional partners travelling from all across Yorkshire and even wider in some cases the day promises to be a real hive of informative and interesting conversation and demonstration. First things first though coffee, as the rest of the team start to arrive at our Leeds office, the venue for today’s event, no time is wasted in getting a brew and getting on with any last minute preparations before the wardens start to arrive. We even had members of staff acting as car park attendants to ensure our wardens find a nearby place to park. Fast forward to 10am and the last of the wardens are arriving just in time for our introduction. Simon Hildon flood resilience team leader stands and gives a short presentation explaining why we’re all here on a Saturday. He jokingly directs any complaints to the steering group we had set up a month or so back (made up of both staff and wardens) to plan the day. Simon then introduces the first activity for the day, a table top scenario exercise designed to get the wardens and professional partners to discuss what they should all be doing at certain times in an event based on past experiences. By midday we’ve all reconvened and are feeding back what we've learnt from the exercise, whether it’s learning a bit more about what the council do during a flood, or thinking about other things wardens could do, or even just finding out at what point the Police, Environment Agency and emergency services start organising Gold response (the official emergency response during major incidents). Just as I'm starting to get peckish lunch arrives and there’s something for everyone. We don't want to lose the momentum we've built in the morning and have arranged for an Operational Field Team to showcase some of their kit outside the main entrance. This includes confined space equipment and high volume pumps, as well as air brick covers, flood doors and leaflets to provided by the National Flood Forum. 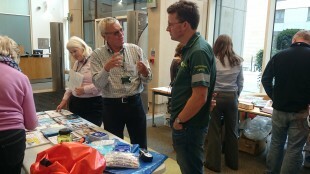 The day gives flood wardens the opportunity to talk to experts in flooding, to ask questions and get advice. After lunch it's back to the meeting room for our guest speaker Charles Richards, a volunteer from the Cornwall Community Flood Forum. Charles like many flood wardens has experienced flooding first hand. He shared with us a story about his experience and the difficulties about living and working in a flood risk area. 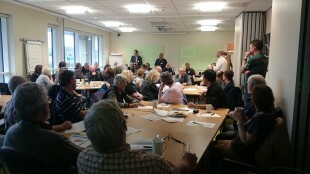 He talked passionately about setting up a flood forum to try and reduce the risk of flooding in his area. This began a number of lively group discussions about the barriers each of our wardens face in their areas, followed by others sharing possible solutions. The last session was the question panel. Made up of representatives from the Environment Agency, Police, Yorkshire Water, City of York Council, Kirklees Council, the National Flood Forum and Cornwall Community Flood Forum the questions, answers and discussions started to fill the room quickly. Little under an hour later and it’s time to wrap up and get back to our weekends, still full of energy from the Q&A and other sessions from the day the wardens left to go and apply their new ideas, and what they had learned in their communities throughout Yorkshire. Andrew Denville is a Flood Resilience Officer for South and West Yorkshire, based the the Environment Agency's Leeds office.